Thank you for contacting the City of Alpharetta. Your service request ID is #3730. This issue was recategorized from Code Enforcement Commercial Issue to Sidewalk Issue. This was an AT&T project that was unrelated to the development in the area. We are attempting to make contact with the utility to get appropriate repairs to the landscaping done if their project is complete. AT&T was the contractor that was working in this area and has completed the project and restored the area. Thank you for contacting the City of Alpharetta. Your service request ID is #3881. Thank you for the information. We will check the area for improvements. Intersection ahead sign is being installed. Currently working with Community Development to make sure new development next to 3750 will not lesson sight lines of driveway. Thank you for contacting the City of Alpharetta. Your service request ID is #4126. The City has been informed that paving of the reconstructed area on Mayfield Road and Bates Road is scheduled to be completed this week, March 22. No additional reconstruction is planned. UPDATE: The contractor has informed us that paving will start March 27, 2019. Thank you for contacting the City of Alpharetta. Your service request ID is #4151. Thank you for reporting this. We will install appropriate signs before crosswalks at the roundabout. If you have any questions, please contact us at 678-297-6134. This area is right above a City Sewer that was placed in 2016. The area has gradually sunken over last 2 years (I have photo from Feb 2017 showing how the curb was broken along the same line above the sewer). 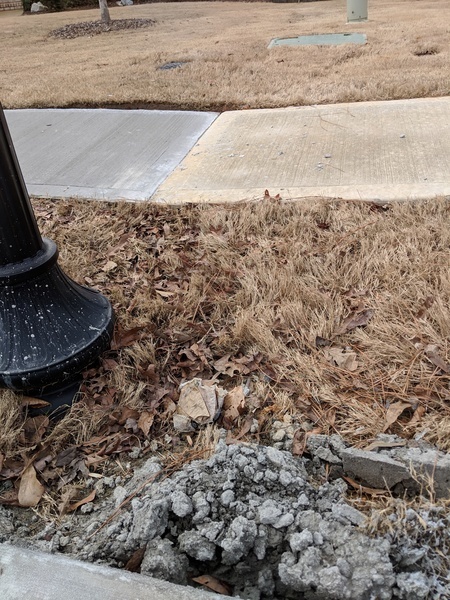 The curb was just fixed but you can see how the area behind (on the grass) and the area before the curb (on the road are still dipped in). I think someone needs to be sure that the area above sewage line is compacted properly, because any cosmetic fix now will not solve the issue. Please also note that the walkway has been fixed twice now (2018 and 2019) in the same area, but it keeps coming back... I think the ground needs be stabilized first. Thank you for contacting the City of Alpharetta. Your service request ID is #4016. Photo from 2017 where road area has not dipped yet, but you can see curb collapsed already. Please provide an address for this issue. Thank you for contacting the City of Alpharetta. Your service request ID is #4140. Thank you for contacting the City of Alpharetta. Your service request ID is #4141. It is 11:15 and I have once again called the police about the noise level from Shade at 10 Broad St in Alpharetta. I called last night as well. Can someone please address this issue with the owners. I don’t understand why this continues to happen. It is getting worse rather than better. Thank you for contacting the City of Alpharetta. Your service request ID is #4125. Thank you for reporting this issue. We spoke with a representative with Fulton County Sewer and they informed us that they were aware of the issue and were in the process of making the necessary repairs.